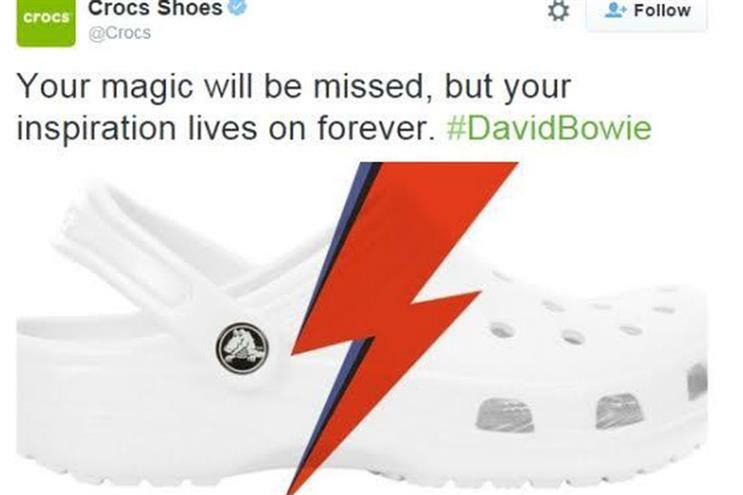 Crocs' tribute to David Bowie on Twitter lasted less than an hour. The post included a picture of a white Crocs shoe with a graphic of a red lightning bolt layered on top, echoing the lightning bolt painted over the face of Bowie’s alter-ego Ziggy Stardust. "Your magic will be missed, but your inspiration lives on forever. #DavidBowie," Crocs wrote in the post. Backlash started immediately after Crocs posted the tweet. Even after the tweet was deleted, social media users continued to poke fun at the brand on Monday afternoon. A number of other brands also paid tribute to Bowie on Monday, after news spread that he died at age 69 after an 18-month battle with cancer.